Everyone has resolutions and goals. Some people want to lose weight, get stronger, start a new hobby or sport, get better at shooting, or whatever. So you pick a diet plan, a hobby, a sport, a goal, and you do the work. You realize your goals. People notice. Your family notices. They congratulate you on your hard work and ask how you were able to do it. You excitedly preach about your path and the methods you use. You feel accomplished, and people care about how you’re doing. Public accountability is a strong motivating factor in sticking to a goal. Knowing that there’s an audience of people watching (no matter the size) can light a fire to keep doing the work. Checking in with progress pictures and having people comment and like give you a nice dopamine hit that makes you want more. Time passes. The newness of your achievements wears off. Now you’re a person who just does a hobby, or weighs a healthy weight. You’re a few years past your goal and you’re just doing your thing without anyone noticing. There is a definite choice to be made here. Either progress in silence, or let the old habits sneak back in. Sometimes people who get a taste of their goal will regress (quickly or slowly) because they fall off the wagon. They wanted to say they achieved their goal more than they wanted to improve as a human. They turned a marathon into an unsustainable sprint just to cross a line. Sometimes the path was wrong to begin with. The diet-plan didn’t jive with your lifestyle or physiology and became unsustainable. Adjust your course and keep going. Injuries and sickness can lead people down a path to failure. For some, they are the beginnings of a cascade of negative emotions, inactivity, and poor choices. Listen to your body, but don’t stop moving forward. Burnout is a big problem for me. I personally tend to get obsessively focused on a goal and work towards it until I can’t stand that activity. When this happens, I have to indulge in some goal-hijacking. I have to allow myself to find something else to focus on while the fire re-ignites for the original goal. I haven’t found a shortcut for this. Just time. Everyone fails and falls short. Everyone gets frustrated and goes off the rails. Everyone gets sick or injured and regresses. You just have to decide that you’ll maintain the discipline to start again. Pro-tip: THE PROCESS IS THE GOAL. Find motivation in the minutia. The deep dive. Depth of study and depth of discipline. Remember why you started, and that you’re doing it for you. For your health, sanity, safety, whatever. People will eventually stop caring, and stop ‘liking’ your progress pictures. They might even mock you for your slip-ups. Rapid improvement will eventually become imperceptible forward progress, or maybe just maintenance. That’s how it is. And that’s fine. The journey doesn’t end. If you find value in my ramblings, please subscribe, share, and shop through our amazon affiliate link. Or consider a small donation through PayPal. I always suggest that if you get the opportunity to practice or train in low light, that you do. It allows you the opportunity to confirm your dryfire flashlight work, confirm your techniques, and see what works and doesn’t when you’re actually shooting. This last weekend, I had the opportunity to get some range time at a private range in NW Georgia. I wanted to try out some of the small flashlights I have been collecting and make sure I’m not taking crazy pills when I say that 60 lumens is still enough. It was impromptu, so I didn’t have an elaborate testing plan. I would have set up something more thorough if I thought of it ahead of time. Weather: light cloud cover which minimized moon light. The range was very dark. With each light, I wanted to check the distance at which I could identify two inch numbers on a target, and the distance that I could see the targets themselves. I also got some shooting in at various distances and positions using a Shooting Solutions AR500 silhouette and a range barricade I built recently. It’s not scientific, but it doesn’t need to be. It’s about what I can see with my eyes and my lights. I’m happy if I can identify details (things in hands) at 7 yards or so. This is the dinosaur of the bunch. It’s actually a good size. The light is that sort of dingy yellow when compared to the brilliance of the white LEDs. It was a good baseline for the other lights. I could readily read the numbers on a target out to about 15 feet, and see the target itself to about 40 feet. 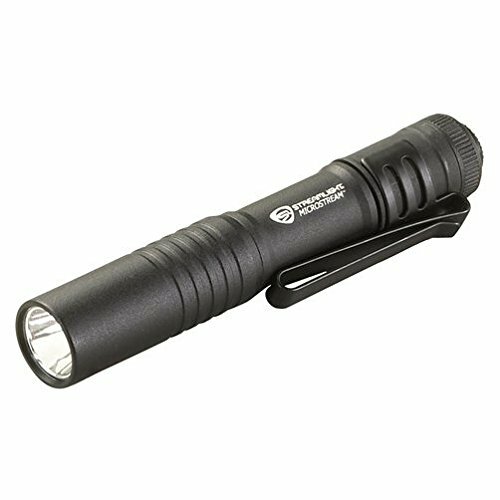 The AAA streamlight was very bright when it came out several years ago. 30 lumens is lacking a bit, though. 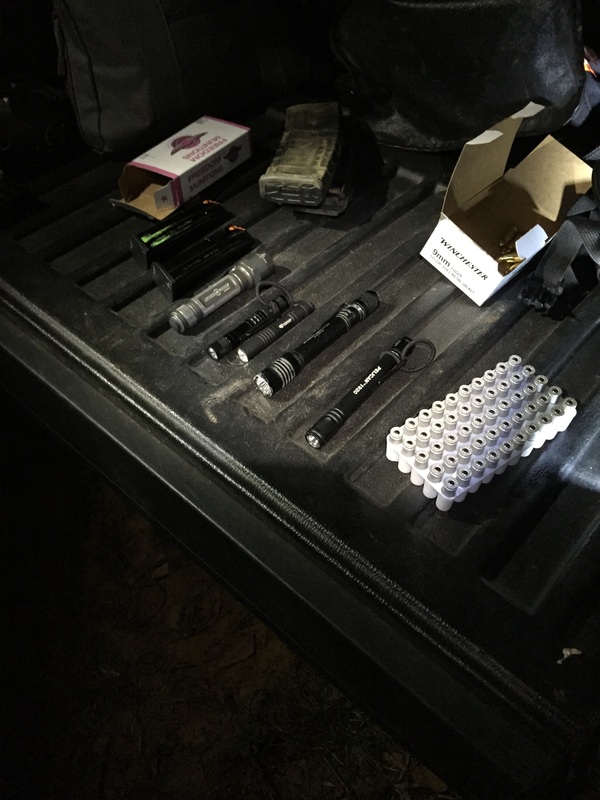 The ranges were (surprise) approximately halved when using 30 lumens. 15 feet for reading numbers, and 30 for seeing the target well enough to shoot. Considering the recent improvements in lights, I would pass on this one. We didn’t even get pictures of the beam on this one. Docooler AAA light. I got this one for $8 last week just because 120 lumens seemed pretty awesome for $8. The beam is all ‘spill’. The light is evenly distributed with no real ‘hotspot’ in the center. The tail cap isn’t momentary. It clicks on and stays on. This isn’t preferred for a tactical light, but I didn’t have much trouble actuating it on the range. My wife’s worn out hair bungee makes a good finger loop so you can drop the light to manipulate your pistol. I could read numbers out to 20 feet or so, and see the target at 50 feet. Streamlight AA Protac. This light is several years old and pretty beat up. The lense is scratched on mine. It’s actually a little long for my liking. Momentary with a slight push, and then will click on. A poor strobe feature isn’t that useful (compared to a Klarus strobe). This light has a more discernable hotspot so it was good for a few extra feet, 25 and 60. I think one could do better, and cheaper, currently. Pelican 1920 2xAAA. This one continues to be my favorite. The diameter is close to a sharpie, and the length is great clipped into jeans or dropped into a pocket. It stays oriented pretty well in a pocket and one can get a good grip and cheek/neck index quickly. The beam (on high) was actually the winner despite its lower specified output. Both my friend and I agreed that this was the winner of the bunch. It fills the hand well, and could be used as a fist-load for striking, or you could hammerfist with it if you had to. I wish it were a single output, but it’s not that bad. It was similar to the Streamlight AA for me, but seemed just a touch brighter. Get out and practice with your lights. For the urban or suburban gun person, these lights would serve your purposes. Easily carried in a pocket or purse, you can light up the dark corners of your life. If you live in the country and are surrounded by wide open spaces, you’ll need more light. All of these lights are perfect for lighting up a dark parking deck, looking around the house, walking the dog, and for shooting at defensive distances. No weapon meant for defensive purposes should be without a light nearby.